November 21, 2015 November 21, 2015 Summerita Rhayne Book spotlighthistorical intrigue, Indian historical, Kindle Unlimited., romance fiction, romance set in medieval ancient India, The Eligible Princess. 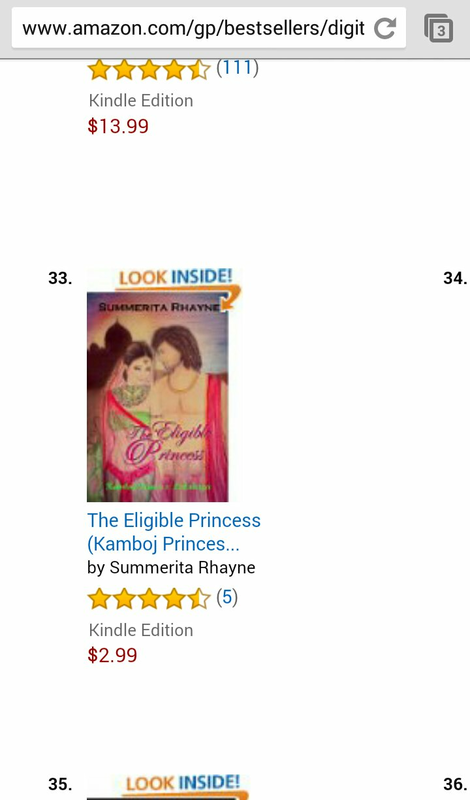 This morning I found that The Eligible Princess is still in top 100 paid bestsellers at Amazon! I’m excited to see that this tale of historical intrigue, with a bit of inventions thrown in, is drawing a great response. It’s getting 2000+ pages read most days at Kindle Unlimited which is another lovely surprise. – From Amazon review by author Deep Downer. If you’d like a sample of first two chapters, please leave a message through the contact me page. But Kartik is not at all what she expected. Attractive and dashing, he sets out to woo her. She’s intrigued and ensnared. He almost wins her heart but then she finds he has secrets and a past which she cannot accept. From princess to queen – The Eligible Princess follows the journey of Princess Lakshaya to find her destiny and love. Also read Hidden Passion, Book 1 in the series.